The FAMCO motorized HVAC dampers are available in spring return, multi blade and power open power close models. The ADO and ADC motorized dampers have a 24 volt or 120 volt motor option. End switches are also available with these models. End switches allow another appliance to be operated when the damper has reached its full power position (either open or closed). The floating motor mount design assures proper alignment of motor, shaft and damper to prevent binding, while the clutch/coupler reduces the number of moving parts for greater service life. All ADC and ADO units without the end switch come with a flow control adjustment so that the damper blade can be blocked from opening or closing 100%. Please keep in mind that the end switch will not work if the flow control adjustment is preventing the damper from reaching its full powered position. Our Multi-Blade Dampers are used for zone control, air inlet and exhaust applications. 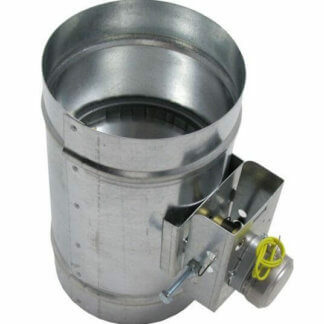 This damper is built with aluminum opposed blades and provides minimum weight with maximum strength. This features a high torque 24 or 120 volt motor, with power open and spring close blades. The parallel blade design provides smooth operation and efficient low leak sealing. The Power Open Power Close Dampers come with a high torque 24 volt motor that operates in both directions. This damper features an easy wire terminal and 3 wires to integrate with two or three zone systems and a rotation switch to set at normally open or normally closed. 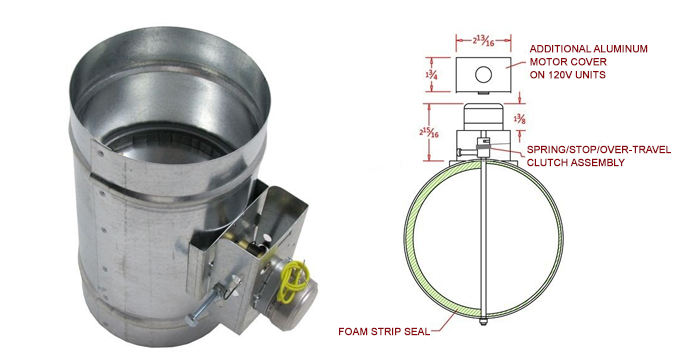 The main purpose of a motorized zone damper is to regulate the airflow in an HVAC heating or cooling system. HVAC systems are often times divided up into multiple zones to further allow more control of cold and hot spots. The other aspect of a zoned heating system is the thermostat. One is placed in each “zone” to control electronic dampers in the air ducts. This ‘zoning’ method not only increases efficiency, but saves you money in the long haul by not having useless movement of unwanted warm or cold air. Often times you will find this on two-story homes. Heat rises, so what you tend to find is that the upper level is usually warmer than the lower one. To beat this, typically two dampers are installed. Another example of efficient use of zone dampers is needing to keep the master bedroom cooler for a more comfortable sleeping temp while keeping a baby’s room a few degrees warmer. Another possible use would be to set up a ‘home office’ room to run monday through friday 9-5. By implementing strategic ‘zoning’ into your home, one can enjoy the benefit of allowing or disallowing air circulation from certain rooms. The FAMCO motorized HVAC dampers come with a spring return and either power open or power close models. The ADO (normally open, power close) and ADC (normally closed, power open) motorized dampers have a 24 volt or 120 volt motor option. End switches are also available with these models. End switches allow another appliance to be operated when the damper has reached its full power position (either open or closed). For example, with an end switch you could hook up both a fan and a damper to a button or a switch. Flipping the switch would send power to the damper, and once the damper was in the open position it would send power to a fan to begin exhausting. All ADC and ADO units without the end switch come with a flow control adjustment so that the damper blade can be blocked from opening or closing 100%. Please keep in mind that the end switch will not work if the flow control adjustment is preventing the damper from reaching its full powered position. Our motorized dampers are used for zone control, air inlet and exhaust applications. 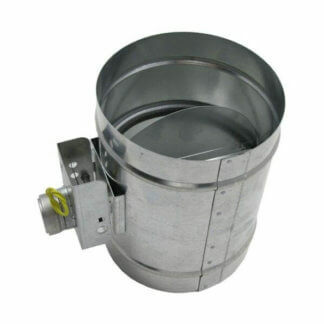 Our dampers are made of galvanized steel with options of size, voltage and end switches. Shop our selection today for the best airflow management control possible.